Piotr Wozniak wanted to be a scientist. The year was 1982, and in an increasingly globalised world, 19-year old Piotr knew that he’d have to learn English to establish himself in the field. The problem was that he didn’t have much time to learn the language – he already had a full schedule at university, where he was studying computer science and biology. But Piotr was determined to find a solution. So like all good scientists, he decided to build a more efficient learning system through trial an error and started by experimenting on himself. He built a database of English words and phrases and split them into separate groups, testing each group at different time intervals. When he started to see patterns emerging, he programmed his computer to track his progress and started to apply the method to his other subjects. In 1987, Piotr turned the algorithm into SuperMemo, a popular software package that keeps track of when digital flash cards are studied and automatically tests the user at spaced intervals. What Piotr has proved at both an individual level with his own experiments and a collective level with the thousands of Supermemo users, is that spaced repetition is highly effective. To learn foreign language vocabulary, scientific definitions or other facts, it’s best to review the material at progressively longer intervals – as more time passes it becomes more difficult to remember and the additional effort required for recall each time leads to significant improvement in long term retention. The finding may seem simple but nothing in the field of cognitive science comes close to it in terms of the immediate and reliable improvements in learning that it brings when it’s properly applied. The ideas Piotr used were not new. The concept of spacing as a method of strengthening retrieval had been analysed by German psychologist Hermann Ebbinghaus, who pioneered the study of memory in the 1880s by discovering the forgetting and learning curves. His work was followed up by Adolf Jost, an Austrian psychologist known mostly for advocating eugenics, who essentially repeated one of Ebbinghaus’ experiments, confirmed his findings and got a law named after him for his efforts. Unfortunately, not much progress was made after Jost’s contribution and it wasn’t until the 1970s that these finding were reinvestigated with the most important developments coming in the last few years. In a 2006 study at the University of California, Nicholas Cepeda and Harold Pashler found that participants who used spaced practice on memory tasks outperformed those using massed practice in 259 out of 271 cases. These results have been replicated in multiple studies since then, so whatever you’re learning, I’d recommend trying spaced repetition – the chances are it will work for you too. In How We Learn, New York Times science writer Benedict Carey cites two main reasons why spacing beats repeated studying or massed practice. First, with very short study intervals, the brain becomes increasingly less interested in the information that’s being repeated. So if I keep repeating that the Battle of Hastings was in 1066, my brain gets bored and ignores it. Second, the effort exerted to try and remember something that’s partially forgotten causes deeper learning. You have to work harder to reconstruct what you’ve studied and this makes ideas stand out and connects them to your existing knowledge. Unfortunately, our intuition encourages us to spend long stretches of time on repetitive massed practice. 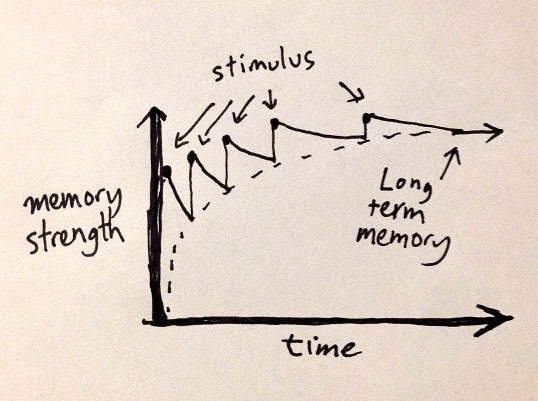 The reason for this is that the quick gains we see from massed practice reinforce our belief that it’s working, even though the benefits are temporary and confined to short term memory. Spacing feels awkward because you’ve allowed some forgetting to set in. This makes it feel like you’re struggling to get on top of the material, when you’re actually embedding further it into your long-term memory. This awkwardness means spacing is rarely used by learners, despite it’s significant benefits. As with other learning strategies such as self-testing and mixed practice, it’s hard for us to imagine spacing will work unless we’ve experienced the results ourselves. The other problem, which teachers and parents are well aware of, is that it can be hard to get students to commit to just one study session let alone multiple ones, even if they are shorter. For adult learners, this type of spaced studying often works better than long blocks and can be worked in during opportune moments that spring up throughout the day – 15 minutes waiting for the bus stop, 10 minutes before the start of a meeting and so on. Construct your self-quizzing schedule according to the material you want to recall. If you’re studying language vocabulary or scientific definitions it’s best to study them after 7-10 days, then again after a month and then again a month or more later, as shown in the graph below. If you’re studying names, it helps to review them again a few minutes after you’ve first studied them – as names are random and don’t contain any specific information in them, the brain struggles to retain them so extra effort is required for successful recall. As you start to quiz yourself on new material, continue to test old material, even if you feel you’re comfortable with it. Anything you want to remember needs to be recalled periodically, so just extend your intervals with this type of material. To take some of the effort out of the process, you can use spaced repetition applications like Anki, which allow you to build your own flashcards and take care of the spacing for you. This means that you're tested on a fact or word just as Anki estimates that you are about to forget it and while this may not be as perfect as your own personal measurements, the convenience means you’re more likely to stick with it. Spaced retrieval is the process of studying information more than once and leaving gaps between sessions. The effort required to reconstruct knowledge that’s been partially forgotten makes it stand out more and reconnects it to other knowledge, which strengthens it. While optimal study schedules have been created for different types of information, the best way to apply this is to experiment and see which intervals work best for you. 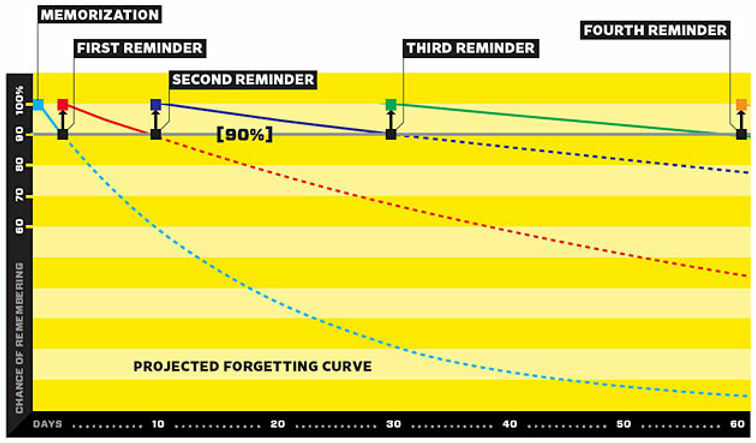 Spaced repetition requires planning. Gather the material you want to learn and think about the best way to test yourself on it. If you're using physical flashcards, make the extra time to plan your intervals and record the results. If you’re studying for a test use the table above as a guide but experiment with intervals to see what works for you. While less effort is required when using software, since the spacing effect is managed for you, you should still make the effort to create your first deck of flashcards and to regularly create new ones. Create physical flashcards for vocabulary, formulas or facts and test yourself on them. Use different coloured pens, draw pictures on them and do anything you can to make them more memorable. Alternatively you can use flashcard software like Anki or Supermemo and test yourself on your computer or smartphone using premade flashcard decks or your own, which is my preferred method. Anki allows you to add sounds, which is great for the pronunciation element of language learning. Memrise and Duo Lingo are two more excellent apps for language learners, which incorporate some of the same spacing techniques the above in a fun, gamified experience. Spacing feels awkward but that means it’s working. Remember that difficulty in learning is almost always desirable - it means you're stretching yourself and training your brain just as you'd train your muscles at the gym. Effort will strengthen your retention by making the material stand out more and reconnecting it to other knowledge. Don’t get concerned if you don’t remember as much as you’d like and don’t return to old habits like rereading and massed practice that feel more productive than spacing, but are much less effective.